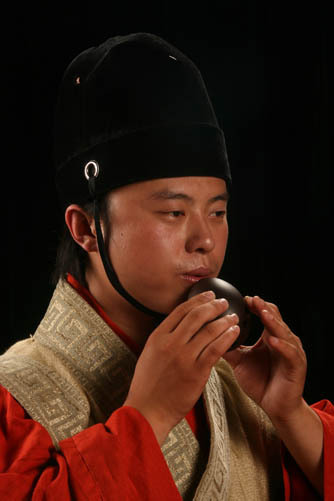 Ancient Chinese described the music of the oval-shaped wind instrument Xun as the sound of autumn. With a history of more than 7,000 years, Xun is one of the oldest instruments found so far in China. It is believed that at the dawn of ancient civilization, the ancestors used a kind of oval stone with naturally formed holes to hunt the preys. When thrown at the animals, the stone produced a whistling sound as the air flowed through the holes, which could have provided inspiration for early wind instruments. The instruments have been found in Neolithic relics along the Yangtze River and Yellow River, and were highly popular in ancient times. 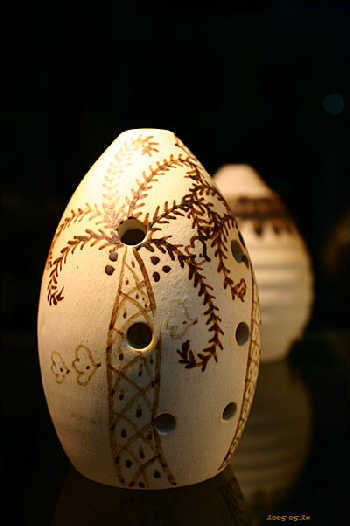 It is easy to make a Xun: mold clay into an egg shape, open no more than 10 holes on the surface and bake it in a fire. In ancient palaces, there were two types of Xun: Song Xun and Ya Xun. Ya Xun was larger and was played at sacrifice rituals while Song Xun was played on other occasions in the palace. The Xun is often accompanied by the Chi, a bamboo pipe with eight holes The music of the two instruments represents a bond of friendship.